Direct links to our business websites are included in this post. Our homeschool has changed over time. As the kids needs and interests have changed, our lessons have changed. One consistent thing through the years has been what some call real life homeschooling. We have merged some lessons from our home businesses with school lessons. 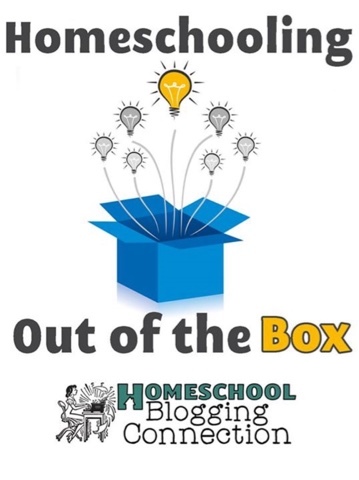 Several Homeschool Blogging Connections friends are sharing their "Out of the Box" homeschooling stories, too. Almost four years ago, my daughters requested ideas for income. 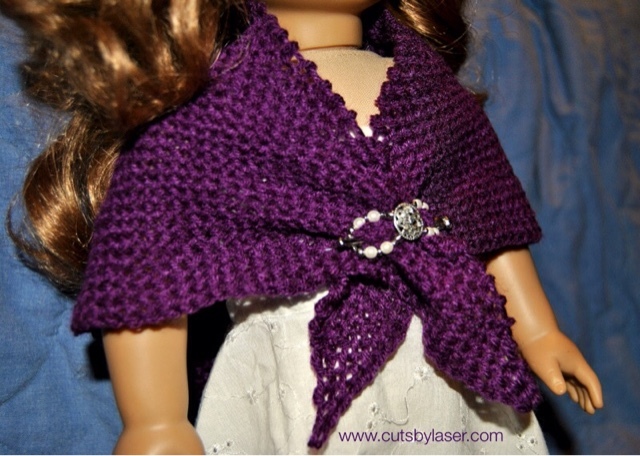 We decided that Lilla Rose would be a good fit as the flexi-clip is a product we all already used and shared. The girls came up with the money for the "party kit" and this business has been as much theirs as mine since we first started. https://www.lillarose.biz/prettyhair is our website assigned by the company the day we signed up as an independent consultant. This business has naturally fit into their homeschool lessons. We signed up hoping it would provide a little extra spending money. It has also provided hands on business lessons, practical math, and fun times with my girls. One daughter shared "I love Flexi clips! I've gotten to help with the book keeping, setup for shows, and much more." This is so much more than the girls experimenting with new hairstyles, though I still enjoy seeing that, too. 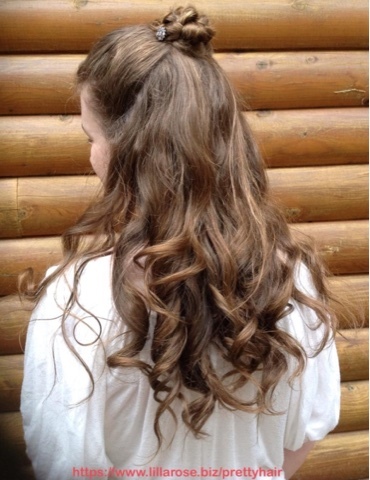 Below, Emily is using our mini you-pins in a half-up style. Hal and Melanie Young shared with us about including children in a family business. "Welcome older children into business discussions" was advised. The responsibility even given to younger children can help them realize that their contribution makes a difference. Another business that has directly influenced our homeschool is Cuts By Laser which is my parents' laser cutting and etching business. They have included all of us in their business giving us the freedom to create and try new things. Last year even my 11 year old son (then 10) designed a Christmas ornament. I've encouraged him to make creating a new one a yearly goal. Jelly Fish Designs is her own line of laser cut products featuring doll sized weaving looms and miniatures. The business has influenced our decisions about additional classes, too. Wanting to learn applicable graphic art skills, over the summer my senior took an intensive Gimp class from Landry academy. She is constantly teaching the rest of us new skills we can apply to the designing process. 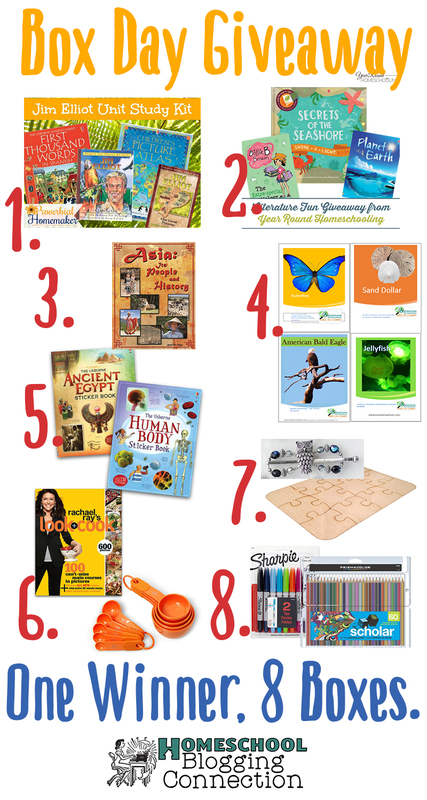 And now -- take a look at this amazing Box Day homeschool giveaway! You can win gifts from each of our home businesses as well as 7 more boxes. We are sharing a #prettyhair flexi-clip and a unique custom etched puzzle made from your own drawing! The winner of this giveaway will receive 8 boxes in the mail! How cool is that? 1. 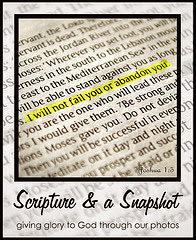 Jim Elliot Unit Study Kit - Enjoy studying missionary stories in your homeschool! Get started with this Jim Elliot unit study kit (retail $44.96) from Tauna at Proverbial Homemaker. Usborne Children’s Picture Atlas for a fun beginning look at the different areas of the world. Mark the different areas you study! Usborne First Thousand Words in Spanish to have fun practicing a language Jim learned as a part of his mission to Ecuador. 2. The Usborne books in this box were contributed from Misty at Year Round Homeschooling and include Secrets of the Seashore, Planet Earth, and Billie B. Brown. 3. Twin-Tip Sharpie Set and Prismacolor Scholar Colored Pencil set from Amy at Homeschool Encouragement. These fun, high quality coloring sets are perfect for using with our grown-up coloring book series and any school project! 4. Wildlife Adventures Unit Studies - 2 Bundles (value $60) from Kelli at Adventure Homeschool. These unit studies will allow you to teach the whole family – together! Each unit highlights a different animal and includes bible, handwriting, science, spelling, vocabulary, language arts, history, geography and more (just add math)! Additional links for more research, and reading suggestions are included, as well as hands on Learning projects and activities for art and creative homeschooling. 5. Education Usborne Sticker Books from Sarah at My Joy-Filled Life. The Human Body Sticker Book is packed with over 130 stickers to help build up a complete picture of the human body and how it works. It contains clear anatomical diagrams and color photographs, as well as stickers of organs, bones, X-rays and scans. Includes links to recommended websites to find out more about the human body and its workings. And, the Ancient Egypt Sticker Book will help you delve into the past with this lavishly designed sticker book, packed with over 120 stickers of magnificent monuments and amazing objects from Ancient Egypt. Discover all about life in Ancient Egypt while adding stickers of beautiful ancient artifacts to complete the pages. 6. A cookbook and measuring set from Ben and Me Blog. Rachael Ray’s Look + Cook—100 brand-new recipes, each featuring beautiful and helpful step-by-step full-color photographs that illustrate how to create each meal, along with photographs of the gorgeous finished dishes. You literally look along while you cook! KitchenAid Classic Soft Grip Plastic Measuring Cups and Spoons Set, Tangerine -- The kitchen measuring cup and spoon set features all the standard size measuring cups and spoons, ensuring precise measurements for cooking accuracy. The handles feature both standard and metric measurements. 7. Features two gifts from the home businesses of Jennifer from Glimpse of Our Life. The Who's Who Owl design is one of our popular flexiclips. Lilla Rose can help with #prettyhair. Cuts By Laser makes custom laser etched gifts, and this prize includes artwork provided by you. Your child's drawing (or your own) can be etched on Baltic Birch and turned into a unique puzzle. 8. Asia: It's People and History from Bonnie at Write Bonnie Rose. Is the land of Asia a mystery to your kids? Do they know who lives there? Do they know how to pray for them? Asia is home to more than fifty countries and territories and roughly three-fifths of the world’s population. Could you use some help introducing your family to this vast land? This sixteen-week course presents a brief picture of six nations. It is by no means all encompassing. Its purpose is to introduce your students to the people of Asia, share their stories, and spark curiosity. Wow what a giveaway! I don't I'm familiar with the Connection. I'll have to look that one up. I'm a new follower on Pinterest for you! I am awed by the lessons you are teaching your kids. Being able to draw them into the business world as a family is precious and I can see where they'll be a force in the business world in the future!